Could Ubuntu Phone go mainstream? Is Ubuntu Phone getting cool? The Meizu MX4 Ubuntu Edition is launching on June 25 in Europe and will go on sale for €299 (around £213) though, as seems to be the fashion these days, getting one won't be as straightforward as going to a store and buying one. Instead you will need to go to Meizu's website to get an invitation to purchase the handset. Even that isn't simple, as the invitation system is in the form of an interactive origami wall that randomly generates invites every day. Although it might prove to be a bit of a faff to get hold of an MX4 Ubuntu Edition, Meizu is confident it will be worth the effort, and has paired up the fledgling Ubuntu Phone operating system with an attractively designed handset and decent specs. 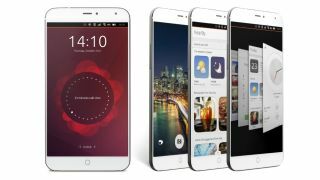 Although the Meizu MX4 Ubuntu Edition isn't the first commercially available Ubuntu Phone handset (that would be the BQ Aquaris E4.5 Ubuntu Edition), it looks like it could be the first desirable Ubuntu Phone – for mainstream users in particular. It comes with an octa-core processor, 2GB of RAM, 16GB internal memory, 20.7MP rear camera, 2MP front camera and a 5.36-inch display with a resolution of 1920 x 1152. It's not a bad looking handset either, and comes in silver and gold colours. Developers in China have had the device since May 17, and we got some hands on time with the MX4 Ubuntu Edition at MWC 2015 earlier this year. We'll be giving the Meizu MX4 Ubuntu Edition a proper going over with our full review soon, so we'll see if the device performs as good as it looks.